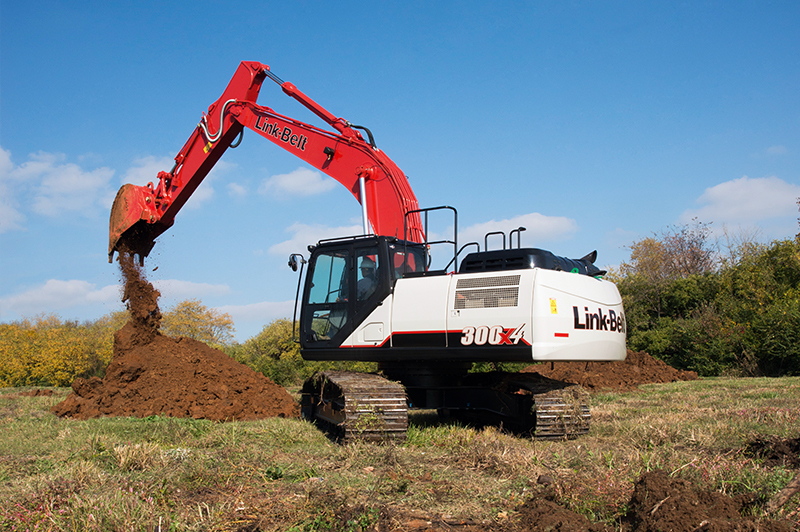 Four new Link-Belt X4 hydraulic excavator models are now available for the US and for Canada. These new models feature advanced, electronically-controlled Isuzu engines that meet Final Tier 4 requirements, with up to 12% improved fuel efficiency than previous models. Diesel particulate filters (DPFs) are not required, and this emissions solution is used across all X4 models. New features include a 30% bigger control valve that creates a larger hydraulic passage area, larger spools and advanced controls to maximize hydraulic system control and responsiveness. Two electrically-controlled Kawasaki variable-displacement axial-piston pumps and one Kawasaki gear pump assure that hydraulic flow is delivered precisely when and where it’s needed. The result is more maneuverability and precision across all operating modes, smoother machine operation and up to 12% faster cycle times. 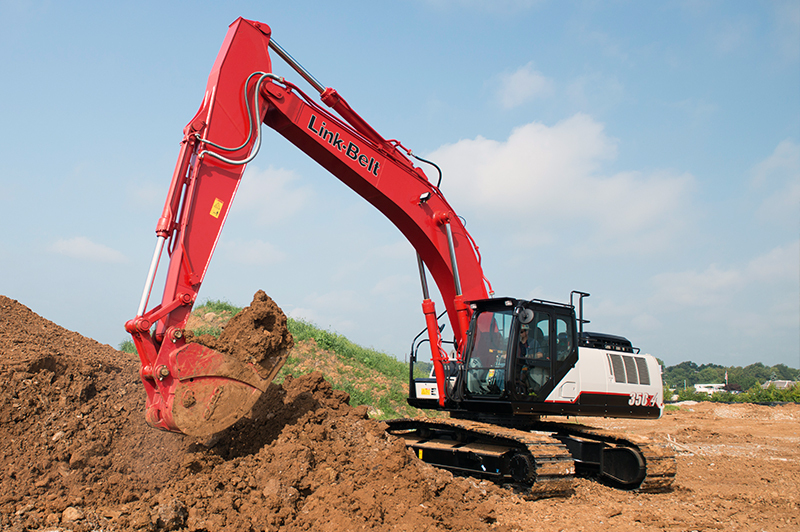 The X4 excavator cab offers better operator ergonomics and comfort. A large, automotive-grade high-back seat provides unprecedented lumbar support and reclines at a 65° angle for a relaxed environment during breaks. Arm rests move proportionally with the console, which means that the distance and angle between joysticks and operator remains the same, no matter how the seat is adjusted. With a large, 7-inch LED color monitor to interface with the machine, an operator can easily navigate a full menu of user-friendly controls to take full command of the excavator and attachments. An operator will also feel safer in the ROPS and FOPS-certified cab, especially with the standard rear-view camera which displays a panoramic view of the worksite from the rear of the machine, with sight guidelines added for increased safety. The Wide Angle View Enhancement System (WAVES) can be added to provide a full 270° viewing envelope with no blind spots. Other notable new cab features include: dual halogen cab lights (with optional LED lighting); a cup holder and storage areas for cell phones and other small items; newly designed joysticks with easy-to-hold grip and radio mute buttons; new MP3 audio input, Bluetooth-enabled for hands-free communication. And, all Link-Belt excavators are equipped with a standard control pattern changer so every operator can feel right at home in an X4. To maximize uptime, X4 excavators are equipped with the RemoteCARE® GPS-enabled telematics system, enabling 24/7 remote monitoring and security. RemoteCARE tracks routine and major service intervals, as well as current machine health, providing more flexibility and control when determining when and where to service machines. The system also provides machine location in real time for better job supervision and remote security monitoring. Flashing diagnostic codes on the monitor quickly alert the operator to potential trouble. Servicing is a snap, with convenient, ground-level access to all routine service points, including sample ports for engine and hydraulic oil. All service ports can be accessed via hand-turn knobs, with no tools needed. The X4 excavators are tough and durable, with improved boss shaping on boom and arm pins to reduce stress; cast boom tips for improved reliability; and stronger cylinder mounts on booms and arms. Structural improvements on the lowers include a thicker travel motor case (up to 32% increase over previous models); thicker plating between side frame and travel motor case; up to 7% larger track rollers; increased tread diameter on track rollers; longer front idler hub; and a shape change on side frames for easy cleaning.